Curia Advance - Equivalent of a Sergeant. Veterans of war who are skilled in the healing and survival of herself and her Sisters. Hospitaller Advance - The most basic rank of the Order Hospitaller after completing her training and taking her oaths to the Emperor. Extremely skilled in plaintive care while also learning new skills to advance. Nurse Advance - More senior novice that often awaiting full induction as a Hospitaller, they have enough basic skills to be useful as nurses and orderlies to help their more senior Sisters. Veteran Sisters from other Orders are typically given this rank when first joining to recognize their previous experience. Novice Advance - Lowest rank within Sororitas, often fresh from Schola Progenium and learning the customs, traditions, and history of the Order. The beginnings of the Order of The Shed Tear was born with their founding saint, Saint Jolene. Starting in the Hospitaller Order of the Cleansing Water, she grew up in the early years of the Adepta Sororitas. Originally a Bride of the Emperor when they were still known by that name during the Age of Apostasy, she was a skilled warrior but found she was a much better healer. When the Daughters of the Emperor were reorganized into the Adepta Sororitas, Jolene fought a few years in the Orders Militant but eventually switched to the Orders Hospitaller when they were made with records citing she “felt that was where the God-Emperor wanted her to be.” The event that got her renown and began her path to sainthood was during the Valiant Crusade. Jolene was originally part of the Order of the Cleansing Water and was part of a detachment working with the Order of the Argent Shroud. During a epic battle, the Canoness Superior was fatally wounded by the Chaos Space Marine Lord. No matter what she did Jolene could not heal her. Both from frustration and not wanting such a holy being die like this, she cried over her, praying to the God-Emperor to save her. It was then that a miracle happened. Her tears healed her wounds destroyed whatever taint that kept her from healing. With both her body and spirit revitalized, the Canoness would continue the crusade with renewed vigor to its conclusion. Though the Valiant Crusade was finished, the region suffered heavily and surrounding areas were still fighting. In order to help relieve them, the Holy Synod of the Ecclesiarchy authorized the making of a new Order Hospitaller. Being nominated into the position, then Jolene was Canoness Superior and the Order was named The Shed Tear after her miracle. She next established their headquarters on the planet Brilliance where she performed her second miracle: healing the Planetary Governor’s son from constant sickness. As a reward, the Order was given the planet’s moon Eden’s Garden to do with as they wish. She oversaw the construction of the hospital Valor’s Haven on the moon that she lived long enough to see opened but not fully constructed. However, she did lead their first mission as an Order where the Sisters were called upon by the Knights of House Lacon in a nearby system to aid them after suffering tremendous losses from Tyranids. Their High King was mortally wounded and infected with a parasite but it was then that Jolene performed her 3rd miracle; managing to heal him after working on him nonstop for three days and nights. In gratitude the House vowed to forever protect the Order’s homeworld and always offer aid when asked for. Jolene eventually perished and shortly after that she was canonized as a saint for performing her 3 miracles. She was entombed in a shrine on Brilliance which the Order of the Argent Shroud have vowed to protect in honor of the saint saving their Canoness. It is said that whenever a Sororitas dies a single tear is shed from her crypt. It has been found to possess incredible healing properties so it is collected by the Order to use in times of great need. Since then her Order has finished construction on Valor’s Haven and hope to continue their saint’s legacy. Several small missions have either participated directly in some major battles or deal with the aftermath. In more recent memory a Waaugh! of Freebooterz invaded the Pulonar System, seeking to loot Brilliance and Eden’s Garden. Many Sisters of the Shed Tear were former Sisters of Battle so they managed to hold off the horde until the Knights of House Lacon arrived. Together, they broke the Waaugh and purged them from the system. The Order of The Shed Tear is part of the Orders Hospitaller under the Convent Prioris which is passed in Terra. The Order was split off from the Order of the Cleansing water to provide one place to offer medicae aid to nearby systems. Officially, the headquarters is stationed on the Shrine World Brilliance and that is indeed where much of the leadership is along with the Shrine of Saint Jolene. However, a majority of its strength is on its moon, Eden’s Garden. Considered a Paradise world, the entire moon has been converted into giant hospital called Valor’s Haven with patches of greenery and forest to help preserve the atmosphere along with providing a mind soothing environment. It was large enough to house entire crews of ships at a time along with those in the Order who live there. Those that know of it will know of the incredible quality of care and masterful skill of the Sisters who treat them. Unfortunately, the moon is only so large and often require a small fee from those not of the Ecclesiarchy, a citizen of Brilliance, members of the Imperium’s armed forces, or the Knights of House Lacon. Supplies for the hospital is mainly produced by the world it orbits with protection given by the nearby Knights of House Lacon. One thing that makes the Order stand out is that, while taking recruits from the Schola Progenium like all Sororitas, a large portion of the Order is made up of veterans from the Orders Militant deemed no longer fit to fight effectively, often being patients before being turned over. Many find this transition hard and they are forced to either accept their new station in life as a Hospitaller or they go mad and become a permanent patient of the hospital. They are given great respect and their experience in war has served the Order well in both treating the wounded and protecting them when outside threats befall them. They have gained a reputation for stubbornly holding besieged wards until help arrives. The Order mainly dedicates their strength to manning their hospital so they aren’t as well known as other Orders. However, they still send out missions throughout the Imperium to give aid when asked for. Saint Jolene was first a crusader after all. 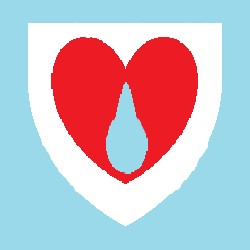 The Order of the Shed Tear uses a tear over a heart that lays over a white shield. The tear represents those shed by their founding saint and the God-Emperor . The heart shows their compassion and their pledge to heal all of the Emperor's followers. The white shield displays their purity and their vow to guard their charges from harm and corruption. As a Orders Hospitaller, it is their main duty to heal but it often demands that they are deployed into battlefields. They are expected to not only heal but defend their charges if necessary. Arm mounted Chirurgeon's tools, diagnosters, medicae kits, and other healing implements are standard issue to them along with either las pistols or hand flamers in the event they need to defend themselves. It should be noted that several members of the Order also have Bolt Pistols for they are a holdover from their time in the Orders Militant before transfering. In standard robes, the Shed Tear uses light blue robes that has a white trim along with a white wimple, both having red inner linings. When they become full Hospitallers they are often seen wearing white aprons or lab coats to show not only that they are fully trained but likely treating or on the way to treating someone. When deployed outside of Eden’s Garden, the Sororitas are issued Carapace armor with dull light blue plates and pure white robes that have red inner linings.